It’s been at least 20 years since I’ve had a Nilla wafer and never had a knock off, but when I saw the Vanilla wafers at Job Lot, I couldn’t resist leaving them on the shelf. This evaluation involved myself and Ethan and then I brought them into work where people wrote thier feedback on a piece of paper. These had a much rougher texture. They felt dryer just by touching them and had a very loud crunch when bitten into and it crumbled into hard pieces. This cookie did not absorb milk well at all. The vanilla flavor was too strong and artificial. Ethan described these wafers as the bottom of a soft serve cone with vanilla ice cream in the grid at the bottom, which is good but does not work as a cookie. Some comments from co-workers were that these were stale tasting (although the date on the box said it was good for another 6 months) too hard, too crunchy, too rough. The same person who wrote the Nilla Wafers were “too soft” wrote that these were “crunchy and good”. 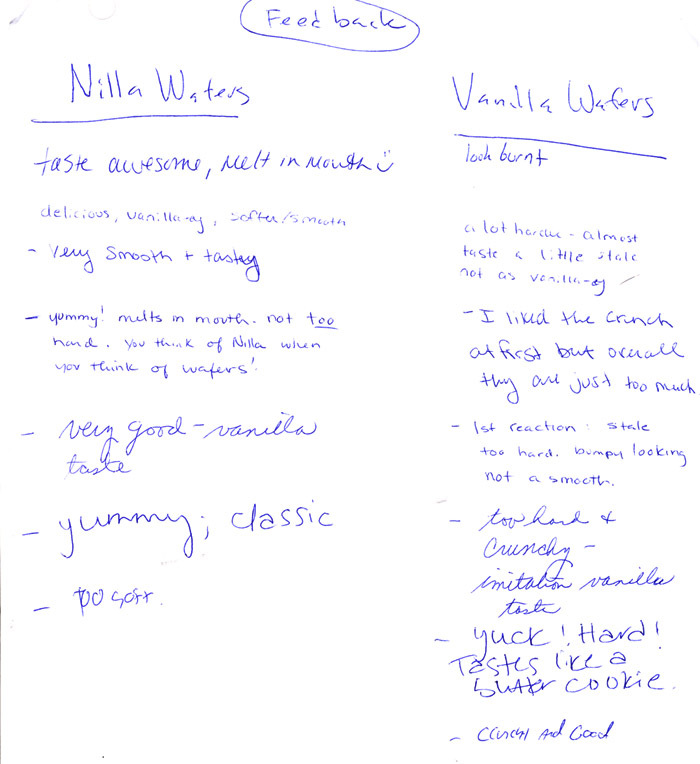 Nilla Wafers were the clear winner. It won people over with it’s subtle texture and mild flavor. The Stauffer’s version was too rough and dry with a poor quality vanilla flavor so it just didn’t have a lot going for it. Although they did have one fan at work. I’ve scanned the feedback sheet because I know I left some comments out, but if interested you can read for yourself by clicking here. 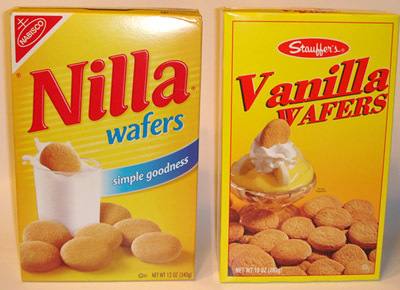 I’d worry about IP infringement for “Vanilla Wafers” in both name and design. 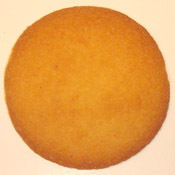 Although Nilla Wafers have been around maybe they’re fair use at this point… Now I’ve got a craving to try them again. I wonder if baking with the (I’m assuming) cheaper brand would make a difference? Sometimes you can get away with different texture and even lesser quality flavor when baking in dishes with other items in them. I might do a compare of that myself. It would be interesting to know. Especially if you could get away with saving money. 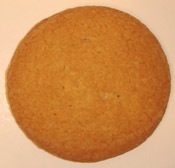 Nilla Wafers completely rule the vanilla cookie universe. That said, I kind of like cheapass “vanilla wafer” cookies because of their crunchiness (a trait I greatly admire in cookies.) The cheap crunchy ones also make a good “crust” for banana cream pie, too, because they don’t soften up too much when the banana pudding gets poured out on top. the trader joe nilla wafers take it to another level. strong flavor of vanilla, better crunch. Too dry!!! – Probably both! What store can you find these wafers in Etobicoke …..Sobeys maybe… I tried No Frills and Metro and they do not carry them! Nilla wafers r the bomb.?????????????????? Every day is World Nutella Day as far as my husband is conercned. He became addicted to it when he lived in Italy, and I will never forget the day he discovered it at our local market. I though he was having some kind of attack. He was speechless with awe and gratitude! Since then I have become a huge fan, too. I love the recipe, great post! Jack’s vanilla wafers are even better than either of those. I came across a Brand Called Buds Best…Vanilla Wafers..they taste pretty close to the original..Harder texture…but if you sip milk it melts just right with a slight crunch. I’m sitting in my bedroom riding out a storm, sharing a bag of store brand vanilla wafers with my dog and cats. I found this site because I noticed that this particular knock off, not only excludes vanilla, but doesn’t even have vanillen. They aren’t vanilla at all!